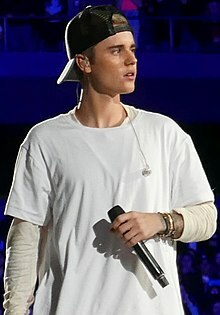 Justin Bieber, ki fèt 1e mas 1994 nan Lond (Kanada), se yon chantè ak aktè kanadyen. ↑ « Justin Bieber Never Say Never – Official website ». Retrieved 17 fevriye 2011. ↑ Jocleyn Vena (25 janvye 2011). MTV, ed. « Justin Bieber Addresses Dangers of Texting And Driving On 'Extreme Makeover' ». Retrieved 8 fevriye 2011. ↑ Fairfax Media, ed. (23 out 2012). Bieber to appear on The Simpsons. Sydney Morning Herald. Retrieved 13 septanm 2012. Paj sa edite a 14:41, 13 janvye 2019.